For a long time now I've been deciding of buying black biker boots. I really like them and I like how you can create different outfits with them that are a bit more edgy. But when I looked at them I was just not sure if they would fit my style. I think I have almost decided now because I really really want these from Zara. I think they look a lot like Acne Pistol Boots but more afordable. I really like the brown details on Acne boots I think they look better that just the black regular ones. i haven't heard about acne until recently. the boots you posted is really stylish and i think they're much better than the Zara ones, there's something about the brown details that make it more chic. 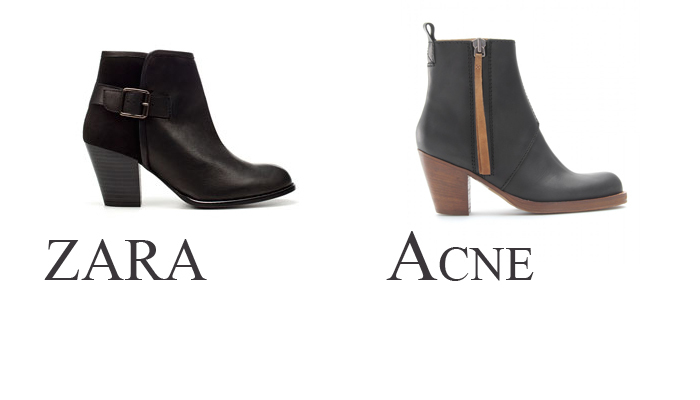 even though i love Zara, i would go for Acne i think. unfortunately, we don't have an Acne shop here, so i have to stick with Zara! I like the Acne one's as well they just look a little bit different to the norm. Hi! I found your blog and I like it so much! cool boots! The Acne ones are more beautiful, but probably not very affordable.. The ones from Zara are pretty too! Oooh I like both, but think the black would look great with tights and a pretty skirt.